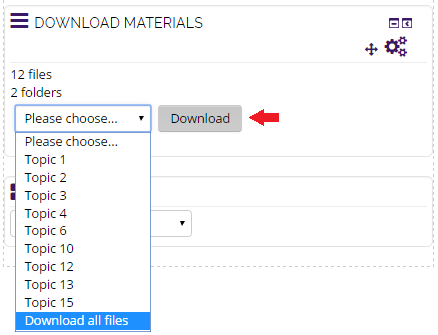 The Download Materials block provides a way to download multiple files from a Moodle course at one time. You may choose to download files from a single section or from the entire course. If the block has been added to the course, it will be available to both instructors and students. However, students will only be able to download files that are not hidden from them in the course. 3. 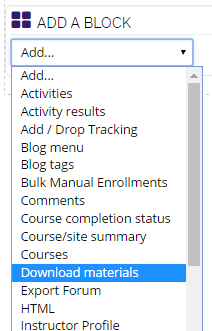 From the Add a Block dropdown menu, select the Download materials option. 4. The Download Materials block should appear. 5. Use the drop down list to choose a single section or all files in a course. Click the Download button after you have made your selection. 6. You will now be prompted to save a .zip file to your computer.